October saw a rush of post-Chuseok comebacks, and as with any other month here at Seoulbeats, some releases were bound to slip through the cracks. For September’s edition of Unsung Artists, we forayed into some K-Indie gems, but this month, we turn our attention back to K-pop. Autumn in Korea often sees an increase in sad ballad releases, but one can always count on K-pop for conceptual and musical variety, no matter the season. Nothing warms my heart more than seeing a group not just be able stay afloat in the merciless sea of the K-pop scene, but also grow and succeed in their own terms. Over the years, BtoB have been promoting consistently, navigating between their niche of strong melodies that tap on their vocal abilities and introducing different genre influences like hip-hop and funk into their core ballad sound. This balance between quality delivery and an element of fun has allowed BtoB to maintain interest within the K-pop fandom circle but also appeal to listeners beyond the typical young K-pop demographic. “Missing You” features a pared-down guitar and piano instrumental with some movement in the form of a syncopated, clean drum beat. The minimalistic, clean sound allows their smooth delivery and vocal harmonisations to shine, and the feelings of wistful longing they convey wash gently over the listener. I have a soft spot for the tinkling sounds of musical boxes and, by extension, songs that make use of them. SM Station is still going strong with the collaborations, and “Star Blossom” perfectly pairs Sejeong’s silvery, subtly husky voice with Doyoung’s vocals, which remind me of early-morning sunshine: warm, but with a light touch. Paired with a simple piano instrumental in a waltz tempo, the track exudes a mellow and sweet charm—not unlike a European vintage toy store in song form—that reflects the MV’s meet-cute story of a young couple. The musical box elements and the orchestral flourish just before the final iteration of the chorus adds a fantastical hint to the song. This is reflected visually by a reverse-motion sequence of Sejeong and Doyoung on dates that transports us back to the moment of their first meeting, of which we’ve already seen glimpses. The other scenes we saw unfolding earlier are now shot in a square aspect ratio and edited for a light-leaked, cross-processed look, achieving a vintage film effect that the first meeting scene also evokes. 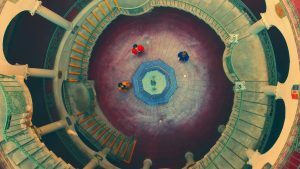 These techniques, combined with the shaky effect produced by the use of a handheld camera, as compared to the relative stability of the shots in the standard aspect ratio, mark these scenes as memories from Doyoung and Sejeong’s perspectives. We aren’t just being shown their love story; we’re placed in their points-of-view as they silently recall, on their present dates, how they first met. It’s these interesting little touches that elevate “Star Blossom” above a typical meet-cute MV. Living up to both the “high” and the “light” in their new name, Highlight injects a hearty dose of goofiness amidst the mellowness of autumn. The MV of “Can Be Better”—whose literal title translates more closely to “it can’t be helped” or “I don’t have a choice”—strings together a series of daily misfortunes to champion this nonchalant attitude towards life’s difficulties. 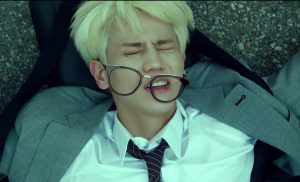 The use of slapstick is so nonsensical it’s wonderful: the slipping-on-a-banana-peel gag is given a twist as Yoseob expertly leaps over a treacherous banana peel, only to be sent crashing to the ground when he lands on an empty Binggrae banana milk bottle, while Junhyung, who is rushing to work, is attacked inexplicably by a flying chicken. The expressions used are simple, but lend the song an emotional complexity that make its encouraging message all the more heartfelt. The song is, in some sense, an inflection of Highlight’s new career trajectory: the sheer scale of their past successes as Beast will continue to bring doubts and insecurities, but it’s clear that they know what they want to do now and they’re happy doing it, and perhaps the best way to cope is just to keep going while embracing such moments of contentment and joy. After a period of sporadic single releases, Juniel has finally made a comeback with a self-composed mini album, Ordinary Things. The EP shows both musical and thematic growth, and there is a strong sense that Juniel is moving towards conveying messages and issues that she feels more deeply for, such as dating abuse in the pre-released “Last Carnival”. “I Drink Alone” is like the melancholic version of Highlight’s “Can Be Better”, expressing emotional exhaustion from the grind of daily life and the feeling of drinking alone and trying to forget what has passed. 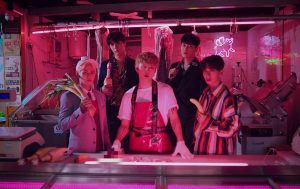 The MV fuses a Midnight Diner-style narrative with the rising trend of honsul, taken from honja (alone) and sul (alcohol). It traces the daily lives of a man caught in a long, wearying process of job-seeking, a young woman who works in a call centre, and a young man who does manual labour stocking groceries at a market. They converge at a late-night restaurant run by Juniel, who seems to be experiencing some kind of ennui as well. As her customers draw simple comfort from her dishes, she too is cheered up by how they light up when they eat, giving the MV a more hopeful tone than the song itself. Leaving the hackneyed, often poorly executed K-pop tropical house trend in the dust, SF9’s latest takes its cue from Latin pop and Spanish flamenco music. The opening guitar line that evokes this genre transitions smoothly into similar-sounding synths, and the song proceeds to weave in more electronic elements while keeping the instrumentals uncluttered and retaining hints of the flamenco influence. Like how the song production melds traditional and contemporary musical genres, the MV also seamlessly combines a romantic setting with futuristic details like a glitching effect that possibly indicates teleportation powers. Not that all forms of combinations work in this release: the blunder of somehow mixing up Spanish (“te quiero”) and latin (“ego dormio”) with Neapolitan (“o sole mio”) is hard to wrap one’s head around, especially given how Zuho revealed that he checked the Italian dictionary while writing the lyrics. Lyrics aside, the visuals of the MV are consistent with the motif of the sun introduced by the title. There is, of course, a literal sun in the background, but the top shots highlight the dance formations’ resemblance to a sun or a sundial (with Rowoon at the centre, encircled by his members). The circular shape is repeated through bird’s-eye and worm’s-eye views of a building and a shot of an airplane hull. The Spaniard influence also reveals itself in the choreography, such as flourishes that bring to mind bullfighting toreros, and steps and poses adopted from flamenco dancing. The resulting performance is captivating—you may, like me, be unable to make heads or tails of what is going on with the rose and the chalice, but that bit of comprehension isn’t required to appreciate the sheer showmanship of this release.